Hot on the heels of the May Design Series, the design team attended HOUSE, an exhibition held at Olympia from 17th-20th June, in association with House & Garden Magazine. The four-day celebration of classic design, craftsmanship and British heritage gave designers and the public a window onto leading and emerging brands. 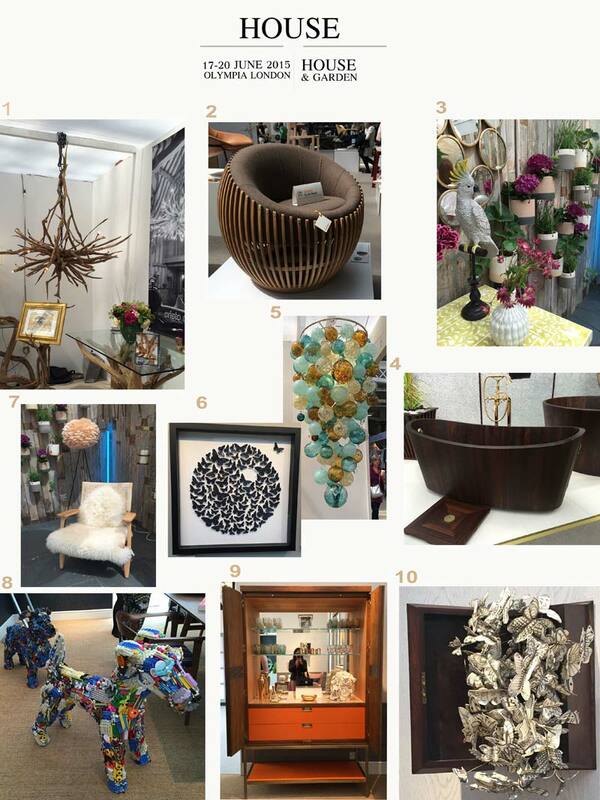 For the ani M Interiors team the highlights included the HOUSE Theatre, The HOUSE designed by April Russell, Design Guild Mark, Mosimann’s Summer Restaurant, The Louis Roederer Champagne Bar, Spirit of Summer Fair, Olympia International Art & Antiques Fair, Designer Guild and more….. Though it was tough to whittle down, the design team has compiled the top ten pieces that won their hearts. No 1. The wooden chandelier by Cristo Design: This centerpiece makes a show-stopping statement. Its asymmetric form brings the natural world into your living space. This could hang grandly above simple, monotone furnishings, adding interest to the clean lines. No 2. The Motley Baton chair designed by Samuel Chan for Channels-Design Guild Mark: How could you resist this simple, sleek and beautiful chair? Its shape combined with polished wood and plush seat make it a tactile delight. No 3. The cockatoo on perch by Graham and Green: Designers and public visitors fell in love with Graham and Green’s quirky piece. As an objet d’art, there are few things likely to raise a smile in the home quite like this piece. It could work well with this summer’s bold leaf prints and bold colours. No 4. First Khis by Frants Seer Khis: These luxuriously deep, smooth, shaped wooden bathtubs are breathtaking. It’s impossible to see one and not to want one, imagining yourself luxuriating for hours. No 5. Mxd Alabaster by Roast Designs: Perfect blown glass baubles make up magical light fittings. These unique pieces, are not only spectacular but they also cast subtle variations of light and colour around a room. Ideal for neutral colour palates where individual colours can be accented. No 6. Box of Butterflies by Cissy Cook Design: This monotone, three-dimensional picture is utterly charming. Many tiny butterflies create the simple, geometric design. It would be equally at home in a contemporary, black and white scheme as it would in a scheme with bold prints and colours. No 7. Leon low-seat armchair and gold chevron cowhide rug by Graham & Green: Effortlessly stylish, low key and yet, sophisticated. There’s no scheme that doesn’t benefit from their distinctive pieces. No 8. Wired Terrier and Doggerfly by Robert Bradford, Rebecca Hossack: Made up from a collection of household items such as pens, combs, pegs and discarded children’s toys, the dog ornaments have to be seen to be believed. The pieces are typical of Bradford’s work, his commentary on consumerism and passing fads manages to be cheeky and joyous. No 9. Bunny Bar by April Russell Design Ltd: Russell excels in drawing inspiration from interior design, architecture, art and lifestyle. Part of Russell’s new range, this hand-crafted cabinet is no exception. The show was overwhelming in its creativity, ideas and scope. Every element, be it the objects on display, the décor of the store or the people exhibiting had a story to tell. HOUSE delighted our senses and will inspire our work.